This is where using generic content often falls short. 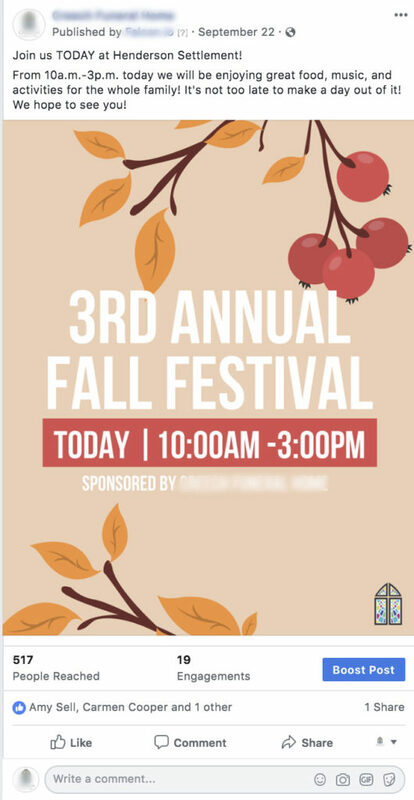 It fails to build a unique relationship between your funeral home and your prospective clients. 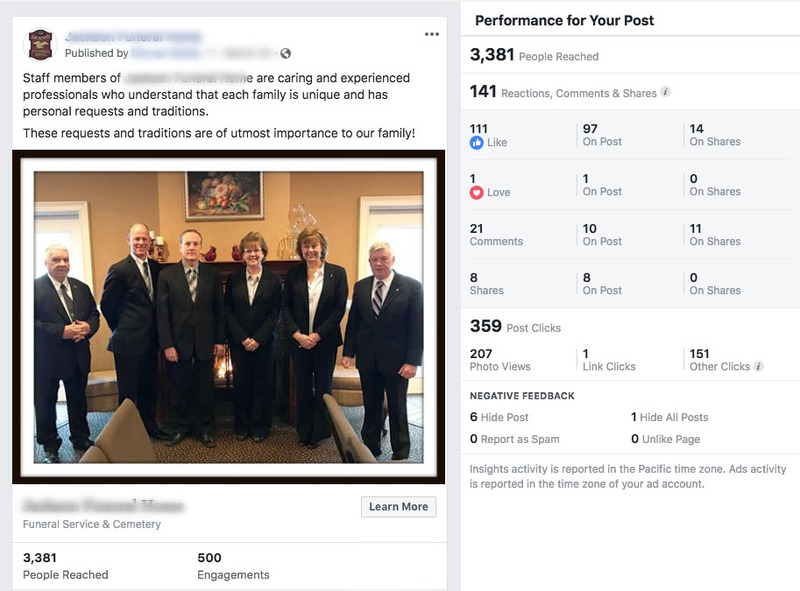 While generic content may get a couple of likes, it doesn’t do anything to convert a user from 'liking' a post, to saying, 'this is the funeral home I want my family to use'. Ultimately, generic content doesn’t leverage people to choose your funeral home. Organic (internal content focused solely on your firm and your people) content is what builds relationships. Organic content will build a relationship between you and your audience. This will increase your transparency which builds trust, and that is the major component of driving pre-need leads. Sales and brand awareness are by-products of the relationship that a customer has with you (your firm). Everything revolves around the relationship you have with your customer and this has to be nurtured over time. Again, you're establishing a relationship and relationships take time and they take effort. You can't automate the building of a relationship. People buy from people, not faceless entities, especially in relationship-driven businesses like funeral care. 80% of funeral home business is relationship driven. Organic content featuring real people will nurture the relationship you have with consumers and in turn, your call volume will increase. An effective way to do this is to introduce your staff on your social media audience. This shows that you’re not going to provide a generic, one-size-fits-all funeral, but that you’re able to personalize the occasion to each individual's unique needs. Some companies think that using a stock photo and a generic “meet our staff” quote is enough to achieve this, but this couldn’t be further from the truth. Using a real picture of your team has been shown to be much more effective at building relationships and increasing engagement. That company that you're buying generic content from...needs to be kicked to the curb. We will prove why below. First, a generic post with a blurry stock photo and the quote ‘Meet our staff we’re dedicated to serving you’. This post reached 119 people and had 16 engagements. 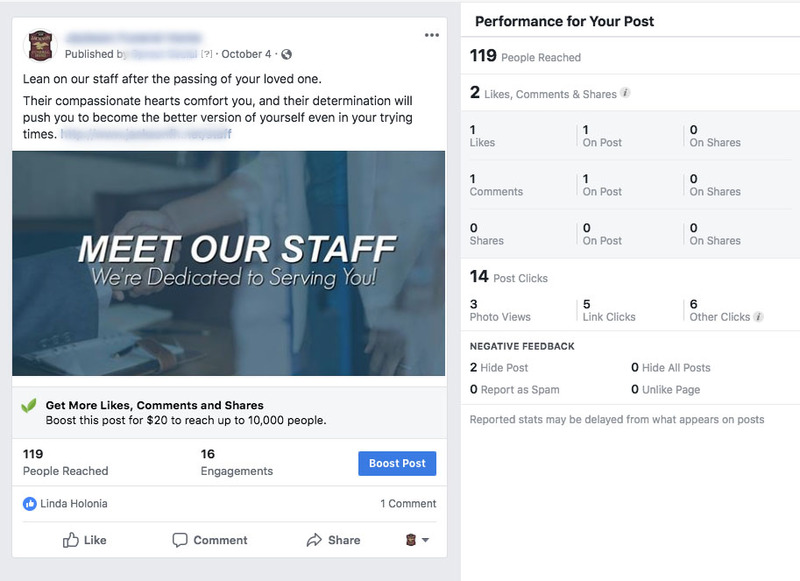 Compare this to 3381 people being reached, and 500 engagements by a post that was the exact same but with a photo of the staff in the post. You can't get this if your 'buying' generic content. Another post with a generic photo and the quote ‘Helping you honor and remember each unique life’ was posted and reached 391 people and had 13 engagements. 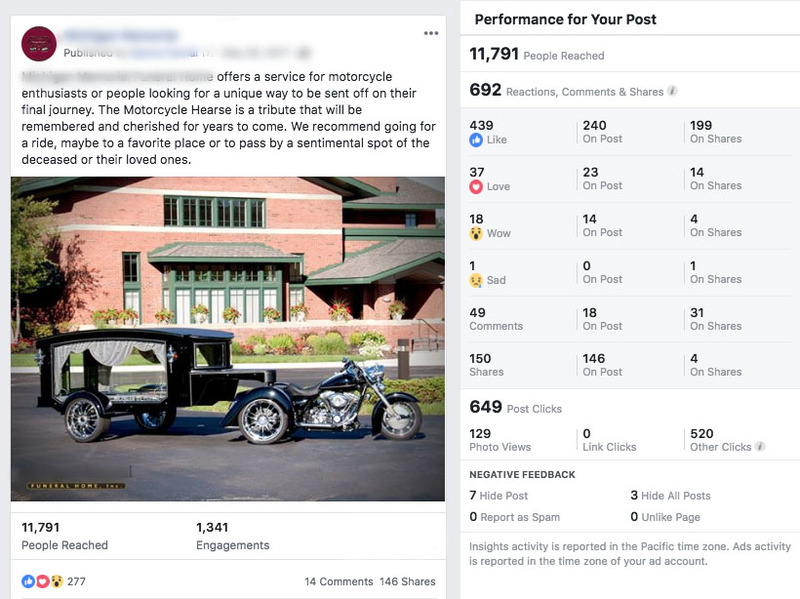 This was compared to an organic post of a ‘Harley Hearse’ that the funeral home offered. The organic post reached 11791 and had 1341 engagements. Organic content shows how you’re unique, it’s visual, it’s real, not everyone could use this photo, it shows how you’re different. 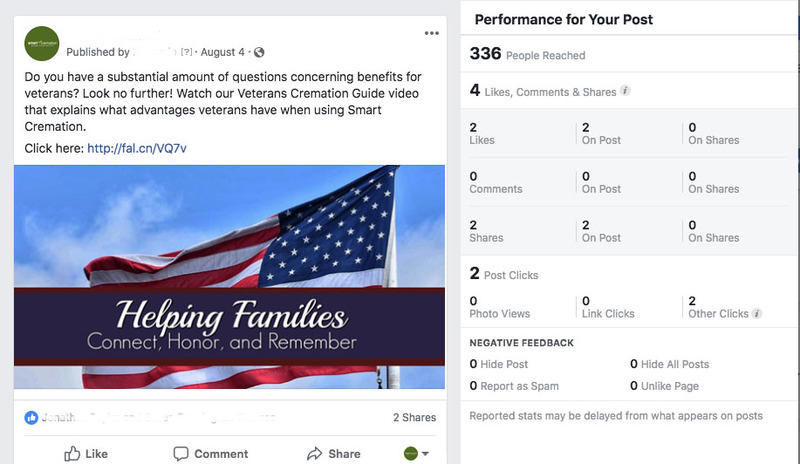 A funeral home wanted to show that it honored veterans so they posted a generic quote ‘Helping families connect, honor, and remember’ and then some original content of their team having a Memorial Day lunch in honor of those who served (not only saying they honor veterans but actually doing it). Both of these posts talked about the same subject but the one with the picture of their team reached 1675 people and had 336 engagements while the other reached 214 people and had only 6 engagements. 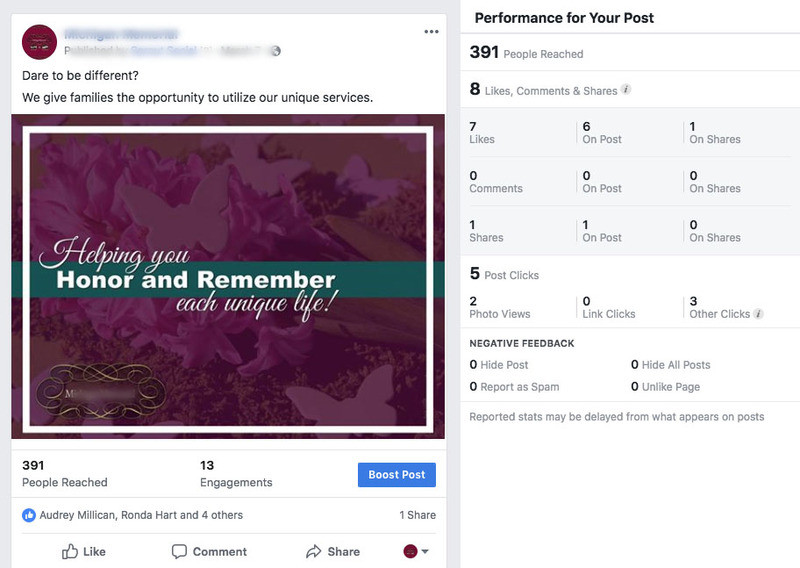 Organic content gives you the opportunity to show what your funeral home can do and does, and clearly shows how you are different from other funeral homes in your area. It establishes relationships, shows real people, and shows that you do something not every other funeral home can do. It reiterates that your company is unique and makes you more approachable. It’s important to make your posts easy to relate to and show what makes your company unique. A great way to showcase your original content is through videos, as they get significantly more engagement than any other post type. Videos tend to get around 75% more engagement than generic quote posts and live videos do even better. 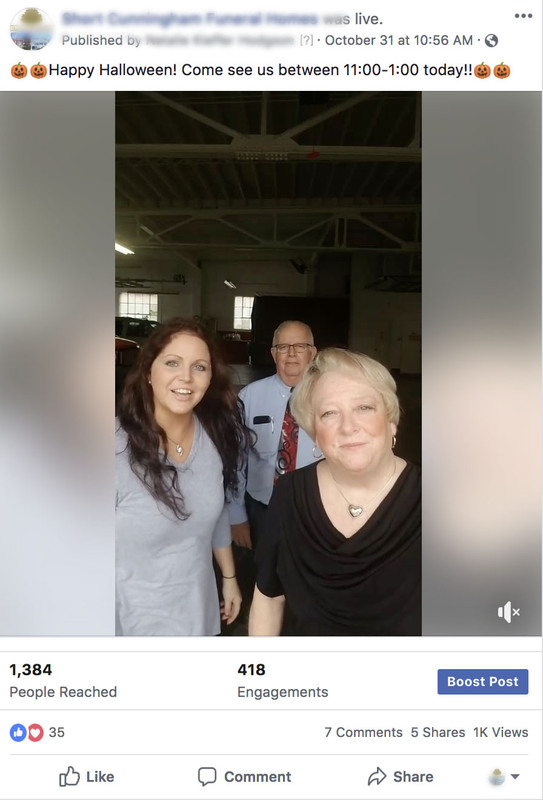 Facebook prioritizes live videos in the news feed giving you even more exposure. The video doesn’t have to be fancy or extravagant. A short clip with you simply answering common questions that come up can still build trust and be incredibly valuable. To promote during the Halloween season a generic quote was posted saying ‘What’s your favorite Halloween tradition’. 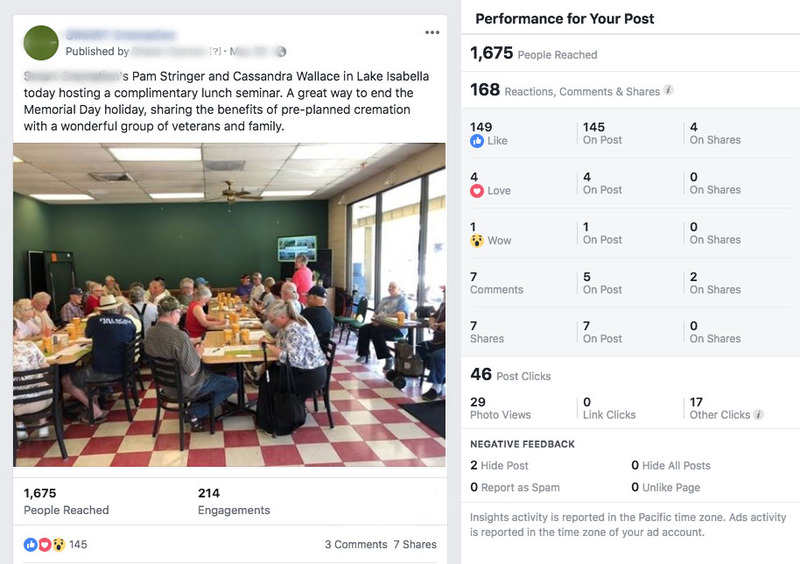 This reached 73 people and had only 1 engagement. 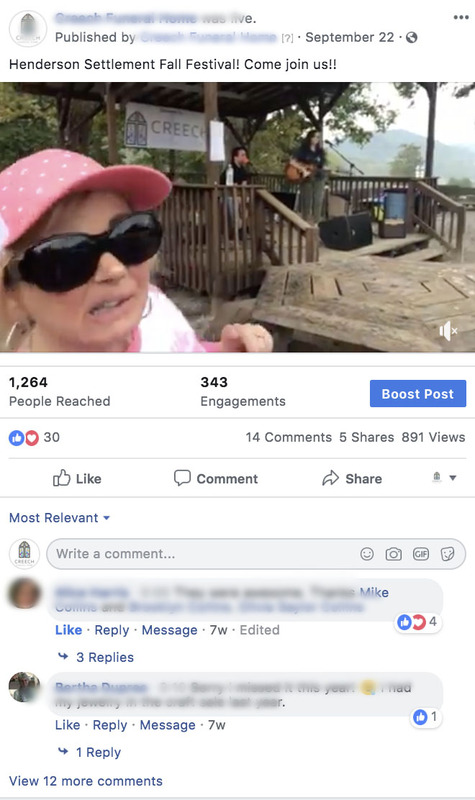 Compare this to a video that was posted with the workers inviting people to stop buy the funeral home during trick or treat, which reached 1384 people and got 418 engagements. To promote for the fall festival we can compare a generic image announcing that the funeral home is sponsoring the festival with a Facebook live video that has real people inviting others to come to the festival. The live video reached 1264 compared to 343 and had 517 engagements compared to 19. What makes using videos even more valuable is the time that’s spent actively watching your content. Infographics can get a lot of engagements but videos always outperform them. 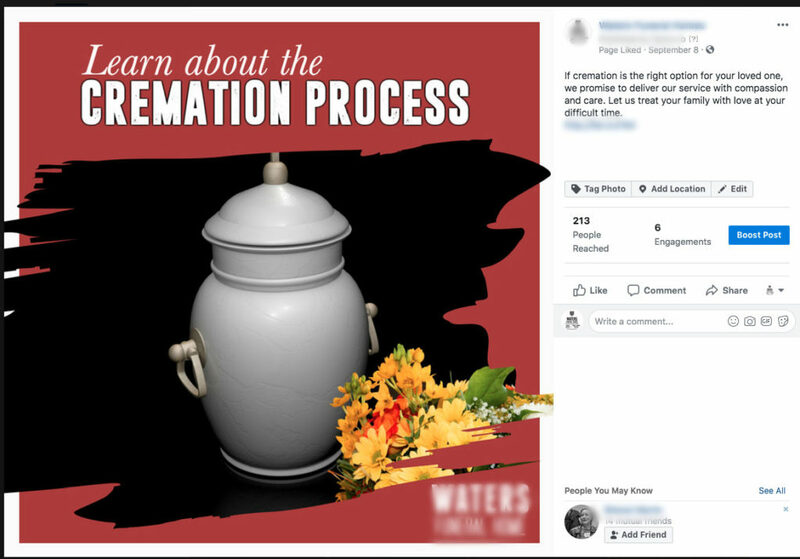 You can really see this with examples, look at how a generic quote saying ‘Learn about the cremation process’ performs against a Facebook live video where they answer questions viewers have about cremations. The first reached 213 people and had 6 engagements while the live video reached 3726 people and had 311 engagements - a huge difference. Not everything you post gets viewed the same amount, it’s exposure will be affected based on many different factors including, the time that you post and the day of the week that you posted on. Check your posts to see when has been the most effective time for you to post in the past and replicate this in the future. Test often and readjust. What kind of organic content is best to make and use? The most powerful strategies focus on people. People relate to people, it feels more real and more organic. We’re social beings and we want to engage with others and know other people, this doesn't change just because you are a funeral home. Our tendencies as human beings and our buying habits don't go out the window just because it is a funeral. Make yourself engageable. Focus on relationships and transparency. Generic quote graphics will not build relationships, they may build some awareness for something you offer but they won’t build trust and they won't convert a user into a client family. The best way to build trust and relationships is through using real people in your marketing and creating a content strategy that is goal based and focuses on organic content. Having a social media vendor that is selling you generic content or better yet, giving you FREE content, will absolutely fail you, 100% of the time.